Habit: Annual, perennial herb, [small shrub, tree, vine], from caudices, taproots, rhizomes, or stolons; hairs 0 or simple. Stem: 0 or prostrate to erect. Leaf: basal, cauline, or both, alternate, [opposite], simple to compound, petioled; stipules generally small; blade linear to round, entire to toothed or lobed. Inflorescence: flowers 1 [raceme], axillary or scapose; peduncle bractlets 2, generally alternate. Flower: bisexual, bilateral [radial]; sepals 5, free, basal lobes present , generally not prominent; petals 5, free, lowest often largest, base +- elongated into a spur; stamens 5, alternate petals, filaments short, wide, with large in-pointing hairs, lowest 2 anthers with basal nectaries extending into petal spur; ovary superior, chamber 1, placentas parietal, 3, ovules  generally many, style 1, often enlarged distally, stigma often oblique or hooked, hairy or not. Fruit: capsule [berry], 3-valved, loculicidal, explosively dehiscent or not. Seed: generally with outgrowth, attractive to ants. Genera In Family: 23 genera, 830 species: worldwide, generally temperate, tropics (especially higher elevations). Note: Lengths of lowest petal including spur. Leaf: generally deciduous. 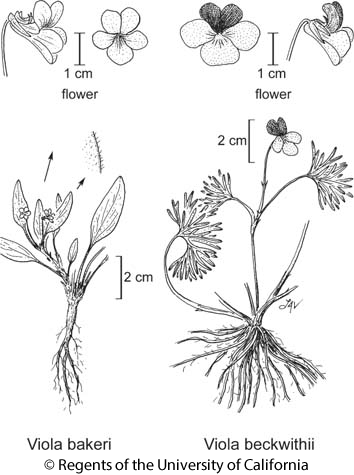 Flower: sepals +- equal, entire; petals unequal, lowest generally largest, with spur generally < 3  mm, lateral 2 equal, generally spreading, upper 2 equal, erect or reflexed, overlapped or not, lateral 2 generally, others sometimes with beard of variously shaped hairs basally; cleistogamous flowers generally present, petals 0. Fruit: ovoid to oblong, hairy or not. Seed: 8--75. Species In Genus: +- 500 species: temperate, worldwide, Hawaii, Andes. Etymology: (Latin: classical name) Note: Important orns including Viola odorata, Viola tricolor L. (Johnny-jump-up, wild pansy), Viola ×wittrockiana Gams (garden pansy). Habit: Perennial herb 2--22 cm, glabrous to puberulent. Stem: decumbent to erect, generally several, up to 1/2 subterranean, clustered on deep caudex. Leaf: ternate-compound; basal 2--6 per caudex, generally puberulent (glabrous), petiole 2--10.5 cm, blade 2.4--5 cm, 3.5--4.5 cm wide, ovate to deltate, +- fleshy, leaflets dissected into several 1--7 mm wide, narrow oblong, elliptic, lanceolate, or oblanceolate segments, tip obtuse to acute; cauline petiole 2--5.7 cm, blade 1--2.7 cm, 1.5--3 cm wide, +- like basal. Inflorescence: axillary; peduncle 2--15.7 cm. Flower: sepals lanceolate, not ciliate; upper 2 petals dark red-violet, often overlapped, lower 3 lilac to +- white, veined dark violet, yellow to orange basally, lateral 2 bearded with cylindric hairs, lowest 10--22 mm; cleistogamous flowers 0. Fruit: 7--12 mm, oblong-ovoid, glabrous. Seed: 3--4 mm, brown. Ecology: Vernally moist places among shrubs or beneath pines; Elevation: 900--2700 m. Bioregional Distribution: KR, CaRH, n SNH, MP; Distribution Outside California: to Oregon, Idaho, Utah. Flowering Time: Mar--May Note: 3 lower petals white in some populations (V.B. Baird 1942). Citation for this treatment: R. John Little 2012, Viola beckwithii, in Jepson Flora Project (eds.) Jepson eFlora, http://ucjeps.berkeley.edu/eflora/eflora_display.php?tid=48163, accessed on April 19, 2019. KR, CaRH, n SNH, MP; Markers link to CCH specimen records. Yellow markers indicate records that may provide evidence for eFlora range revision or may have georeferencing or identification issues. Purple markers indicate specimens collected from a garden, greenhouse, or other non-wild location.